EXPORT QUALITY ASPARAGUS - A former MNLF combatant and member of the Sumbakil Multipurpose Cooperative in Polomolok, South Cotabato, harvests asparagus from the co-op's 11-hectare production area, which the co-op will sell to multinational company through a contract growing arrangement. 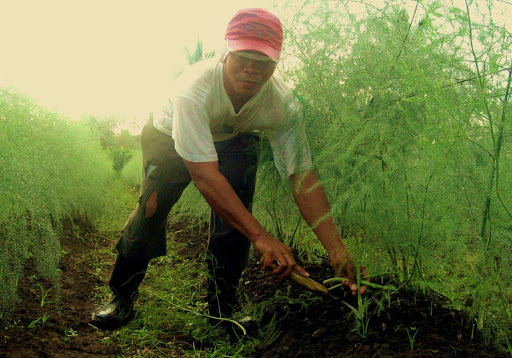 The Sumbakil group is one of 128 cooperatives and farmers' associations assisted by USAID's Growth with Equity in Mindanao (GEM) Program to engage in high-value crop production. GEM, under the oversight of the Mindanao Development Authority, helps these groups to expand their market outreach and to improve their agricultural competitiveness through training on improved production and packaging.